Aristotle is pretty sure he doesn't need anybody. He doesn't exactly have friends, his older brother is in prison, and his parents seem to be silent about the things that really matter. One day at the local pool, he meets a boy named Dante who seems effortlessly comfortable with who he is. The two boys strike up an unlikely friendship. It's good that the friends found each other, because Aristotle and Dante are about to be challenged in ways they never imagined. I listened to this as an audiobook, which is narrated by Lin-Manuel Miranda. You may know him from a little show called Hamilton. Miranda is a perfect narrator and I will forever think of his voice as Ari's. 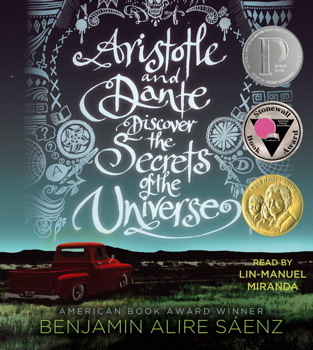 This is not just the skill of the narrator though; Benjamin Alire Saenz has written an unforgettable protagonist with a unique way of looking at the world. I loved the way that Saenz wrote the relationships between the boys and their parents. As the story progresses, we see both sets of parents open up to the boys and become more honest with their older children. I enjoyed seeing good parents try the best that they could to relate to and guide their sons, in spite of their very different parenting styles. I had a little bit of trouble getting into this one, but I'm glad I stuck it out. Ari and Dante are at that terrible place in adolescence where you are no longer a kid, but you aren't sure how to navigate being an adult. They have the added trouble of figuring out how to be seen as men and whether or not they are allowed to show emotions or compassion. Aristotle and Dante Discover the Secrets of the Universe is the kind of book that reminds you of the power of friendship, and how your life can be radically changed just by having someone who will take you as you are, who can laugh with you and ponder the big questions of life. It's also a story of first love and the way that it can be simple to fall in love with your best friend, even if it isn't always easy. It's Monday. How is your long weekend? It's Monday and I'm reading again! It's Monday; how was your Readathon?